The Woodstock Film Festival is made possible in part with public funds from the New York State Council on the Arts, a State Agency. The Woodstock Film Festival has two notable events coming up in 2017, the 5th Annual Taste of Woodstock and the 5th Annual Spirit of Woodstock. Both events highlight some of Woodstock’s finest culture while simultaneously raising funds to help support the important contributions that Woodstock Film Festival makes to the arts and economy in the area. On Wednesday, May 24, the 5th Annual Taste of Woodstock will celebrate the culinary diversity and delicacies that the region has to offer. 2016 featured over 20 participants including Bistro-To-Go, Bread Alone, Catskill Mountain Pizza, Cheese Louise, Cucina, Garden Cafe, The Green Palate, Landau Grill, Lenny Bee Productions, Mountain Gate Indian Restaurant, New World Home Cooking, Oriole 9, Peace Love & Cupcakes, Provisions Woodstock, The Reservoir Inn, Santa Fe Woodstock, Shindig, Sunflower Café, The Tea Shop of Woodstock, Woodstock Yoga (for stress busting, cookies & kombucha), Woodstock Wine & Liquors, Woodstock Meats, and Yum Yum Noodle Bar. On the day of the event, guests arrive at the Film Center at 13 Rock City Road and receive a walking map listing the restaurants as well as a voting card to pick their favorite dishes. Guests mingle with each other while sampling wine, beer, and other beverages with the backdrop of a smooth jazz soundtrack and a welcoming atmosphere. With the Film Center as home base, guests are free to walk about town at their leisure and delight their palates with an incredible variety of food and drink. In the past, world-renowned Chef Ric Orlando has been a feature chef and received Best Overall at the 2015 Taste of Woodstock. He is the owner of New World Home Cooking Co. and is well-known as the Food Network CHOPPED Champion in 2010. Another notable participant is Peace Love & Cupcakes' Janice Hardgrove-Kollar. She was a Pillsbury Bake-off Finalist and also Food Network's Winner for Best Cake in the Country. At the 4th Annual Taste of Woodstock several local restaurants were presented with a variety of coveted awards. The Best Overall award was presented to Bread Alone. There was a tie for Best Main Course between Provisions Woodstock and Woodstock Meats. Landau Grill was awarded with Best Appetizer and Best Side Dish went to Cheese Louise. Best Dessert was given to Peace Love & Cupcakes and Best Beverage was awarded to Catskill Mountain Pizza. Do not forget to purchase your tickets! On Saturday, June 3rd, 2017 the 5th Annual Spirit of Woodstock will take place. This event will honor an individual who embodies the fiercely independent spirit that has made Woodstock famous for over 100 years. Cocktails and hors d'oeuvres will be served at a scenic estate overlooking the Ashokan Reservoir. The Spirit of Woodstock celebrates the roots of the Hudson Valley: its natural beauty, rich art and culture and the independent spirit of the people who live there. Previous honorees include Michael Lang (one of the founders of the 1969 Woodstock Festival), Congressman Maurice Hinchey, Mark Braunstein, Levon Helm, Ron Nyswaner and Philippe Petit. The honoree for 2017 will be announced shortly. This year there have been several Academy Award nominations with ties to the Woodstock Film Festival and the Hudson Valley. These films have been nominated for several awards including Best Picture, Best Actor in a Leading Role, Best Actress in a Leading Role, Best Actor in a Supporting Role, Best Actress in a Supporting Role, Best Cinematography, Best Costume Design, Best Directing, Best Documentary (Feature), Best Film Editing, Best Music (Original Score), Best Short Film (Animated), Best Writing (Adapted Screenplay) and Best Writing (Original Screenplay). There have been other noteworthy films that have recently gained attention with their releases and trailer premiere. This month the key films are LEFT ON PURPOSE, GROWING UP SMITH, STRAY BULLETS and IT COMES AT NIGHT, all of which have screened at the Woodstock Film Festival. Filmmaker Roger Ross Williams has been nominated by the Academy for his wonderful documentary LIFE, ANIMATED. The documentary is being nominated for Best Documentary (Feature). LIFE, ANIMATED screened in a special screening through the Woodstock Film Festival at Upstate Films back in June. Director Roger Ross Williams was on site for a Q&A. Roger Ross Williams also participated in the Woodstock Film Festival last fall, where he was a member of the Documentary Jury and engaged audiences in the "Telling Their Stories" Panel. Roger, a resident of the Catskills region, is no stranger to the Oscars, having won with MUSIC BY PRUDENCE for Best Documentary (Short Subject), about a 21-year-old Zimbabwean singer-songwriter Prudence Mabhena, who was born severely disabled and has struggled to overcome poverty and discrimination. His film GOD LOVES UGANDA screened at Woodstock Film Festival in 2013. "Shortly after he turned three, Owen Suskind, the son of journalist Ron Suskind and his wife Cornelia, stopped speaking. Owen was diagnosed with autism, but as the years passed, his family discovered that he had memorized the dialogue to every Disney animated film. As he has grown to adulthood, Owen has gained vital life skills through his connection to animated movies." Signe Baumane has made significant contributions to Woodstock Film Festival since the very beginning. She worked for the Annual Animation Spectacular before passing the baton to Joy Buran and Noelle Melody in 2016. Signe has also had several films featured at Woodstock Film Festival over the years. Signe Baumane's new Animated Feature Film, MY LOVE AFFAIR WITH MARRIAGE, is currently in production. We are incredibly grateful for all of her time and commitment at Woodstock Film Festival and wish her incredible success in this new endeavor. "This animated feature film delivers a punchy tale of love, gender and marriage. Zelma, a fiery young woman with wild imagination, journeys through many marriages, some real, some imaginary, while confronting societal pressures and her own biology." BORROWED TIME, which screened at the 2016 Woodstock Film Festival, has received a nomination for Best Short Film (Animated) at the 89th Academy Awards. "In the film, a weathered Sheriff returns to the remains of an accident he has spent a lifetime trying to forget." Upstate Films in Rhinebeck will be screening DISTURBING THE PEACE, which screened at the 2016 Woodstock Film Festival. on February 20 at 2pm with a Q&A by Stephen Apkon, Marcina Hale, and Combatants for Peace. "DISTURBING THE PEACE follows sworn enemies – former Israeli soldiers from elite units and Palestinian fighters, many of whom served years in prison – who have joined together to challenge the status quo and say “enough.”...This is a story of human potential that’s unleashed when we stop participating in a story that no longer serves anyone, and fueled with the power of our convictions, take action to create new possibilities. The film reveals amazing transformational journeys from soldiers committed to armed battle to nonviolent peace activists, all leading to the creation of Combatants for Peace. While based in the Middle East, DISTURBING THE PEACE evokes universal themes relevant to us all and inspires us to become active participants in the creation of our world." GROWING UP SMITH, which was release on February 3 was recently named Time Magazine Film of the Week. The film has also received outstanding ratings on Rotten Tomatoes. At the 2015 Woodstock Film Festival the film, which was then titled GOOD OL' BOY, won the Audience Award for Best Narrative. See it now at a theater near you. "When an Indian family moves to America in 1979 with the hope of living the American Dream, their 10-year-old-son, Smith, falls head-over-heels for the girl next door. With an American Dream of his own, Smith strives to become a "good ol' boy," propelling him and his family further away from their traditional ideals than ever before. GROWING UP SMITH is a heartfelt coming-of-age comedy about an irrepressibly-like-able 10-year-old boy from India who may possibly lose it all--including the love of his life--when his obsession for living the American Dream unexpectedly takes a wrong turn." Make sure to check out the gripping trailer for IT COMES AT NIGHT, directed by Trey Edward Shults, and starring Joel Edgerton and Riley Keough. The film, which was produced in Woodstock in 2016 is due out in theaters August 25, 2017. Director Trey Edward Shults screened his film KRISHA at the 2014 Woodstock Film Festival. Additionally, Co-producer Corey Deckler produced CLUB POLICY, which screened in the "Jests" program at the 2016 Woodstock Film Festival. "Secure within a desolate home as an unnatural threat terrorizes the world, the tenuous domestic order he has established with his wife and son is put to the ultimate test with the arrival of a desperate young family seeking refuge. Despite the best intentions of both families, paranoia and mistrust boil over as the horrors outside creep ever-closer, awakening something hidden and monstrous within him as he learns that the protection of his family comes at the cost of his soul." LEFT ON PURPOSE opened Friday, February 10, 2017 at the Cinema Village. This compelling documentary had its world premiere at the 2015 Woodstock Film Festival. Director Justin Schein and Co-director David Mehlman attended the festival and participated in Q&A alongside Eden Wurmfeld and Yael Bridge. LEFT ON PURPOSE was the winner of the Audience Award at the 2015 Woodstock Film Festival. The documentary has collected several other awards over the past years including the Berkeley Film Festival 2016 Special Jury Award, the DOC NYC 2015 Audience Award, the Astra Film Festival 2015 Best of Fest, the Florida Film Festival 2016 Best Documentary and lastly the Destiny City Film Festival 2016 Grand Jury Prize. "Midway through the filming of a documentary about his life as an anti war activist, Mayer Vishner declares that his time has passed and that his last political act will be to commit suicide— and he wants it all on camera. Now the director must decide whether to turn off his camera or use it to keep his friend alive. LEFT ON PURPOSE is an award winning feature length documentary that confronts the growing issues of aging, isolation and end of life choices through an intense character driven story of the relationship between filmmaker and subject. With humor and heart it provides a rare cinematic look at what it means to be a friend to someone in pain." 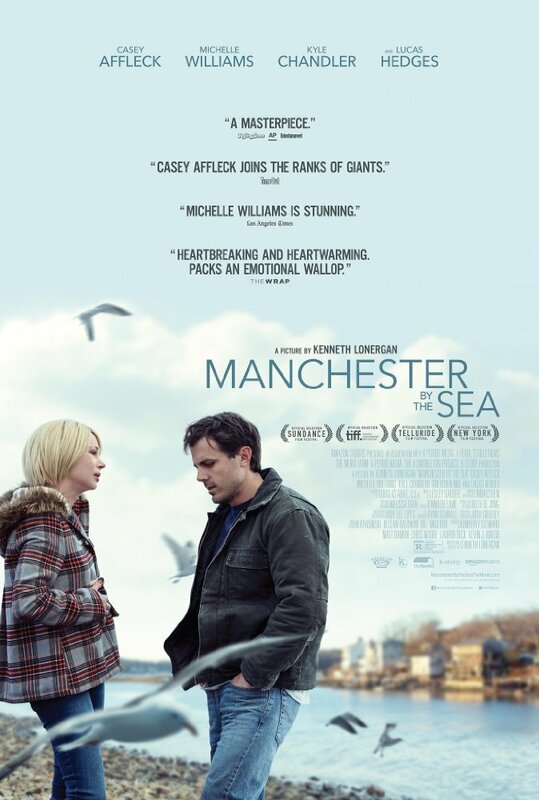 MANCHESTER BY THE SEA has 5 Academy Award nominations this year for Best Actor in a Leading Role (Casey Affleck), Best Actor in a Supporting Role (Lucas Hedges), Best Actress in a Supporting Role (Michelle Williams), Best Directing (Kenneth Lonergan) and Best Writing Original Screenplay (Kenneth Lonergan). Kenneth Lonergan's first feature film, YOU CAN COUNT ON ME (2000), starred Mark Ruffalo, a resident and environmental activist who won Woodstock Film Festival's Giving Back Award in 2011. This film had strong involvement of Hudson Valley residents including Declan Baldwin (executive producer and unit production manager), Amy Teitter (set decorator) and Derek Ravita (assistant local director trainee). "When his beloved older brother dies, handyman Lee Chandler (Casey Affleck) returns to his hometown, a close-knit fishing community in Massachusetts. There, Lee struggles to cope with his current grief and tragedy from his past while also summoning the strength to comfort his teenage nephew (Lucas Hedges), who has been left in his care." MOONLIGHT by Barry Jenkins has received 7 Oscar nominations including Best Actor in a Supporting Role (Mahershala Ali), Best Actress in a Supporting Role (Naomie Harris), Best Cinematography (James Laxton), Best Directing (Barry Jenkins), Best Film Editing (Nat Sanders and Joi McMillon), Best Music Original Score (Nicholas Britell), and Best Writing Adapted Screenplay (Screenplay by Barry Jenkins and Story by Tarell Alvin McCarney). Earlier this year, MOONLIGHT won the Golden Globe for Best Drama Motion Picture. At the 2008 Woodstock Film Festival, Jenkins received an Honorable Mention for the Lee Marvin Best Feature Narrative Award for his debut film MEDICINE FOR MELANCHOLY . "As he grows from childhood to adulthood in Miami, a young black man grapples with surviving the poverty and drugs that pervade his neighborhood establishing his own identity and accepting his sexuality. Under the influences of his drug-addicted mother, a kindly surrogate father and a conflicted best friend, the youth finds his way in life." The production, which was directed by 16-year-old Jack Fessenden during the summer of 2015, features locations in Stone Ridge, Rosendale, Kingston, Woodstock, and West Shokan. The cast stars Asa Spurlock, Jack Fessenden, James Le Gros (Drugstore Cowboy, Bitter Feast), John Speredakos (Fantastic Four, Inside Man and The House of the Devil), Robert Burke Warren, Steve Heller. Roger Peltzman, Eric Kraus, Kevin Corrigan (Dice, The Departed, Goodfellas), and Larry Fessenden, who was also co-producer and director of photography. "In upstate New York, two teenage boys are tasked with cleaning out their father’s old mobile home on an abandoned property, but the boys are in for a surprise when they discover three crooks on the run have taken refuge in the trailer." Sundance Film Festival 2017 has come and gone, and along with the presidential inauguration, the subsequent Women's March and a cyber hack, it was yet again one of the most important independent film gatherings on the film festival circuit. The Women's March on Main in Park City was attended by over 8,000 Sundance participants including Woodstock Film Festival's executive director Meira Blaustein who walked with Women in Film/TV/Media/Digital. One of Meira Blaustein's roommates from the festival, Isabel Gomez-Moriana, provides additional information regarding this year's Sundance Film Festival and the current state of independent filmmaking in her article in Canadian Film Centre. Still, it was business as usual at Sundance as buyers went into the occasional bidding frenzy over some of the hottest movies. Inspiring events were taking place day and night, whether it be at the New Frontier and VR Palace or The New Climate sidebar (which opened with INCONVENIENT SEQUEL; TRUTH TO POWER, featuring Al Gore’s ongoing crusade to conquer climate change). A Celebration of Music and Film, which is hosted annually by the Sundance Institute Film Music Program, was a special presentation that featured music and spoken word by Common, Ava DuVernay, Laura Dern, Gael Garcia Bernal, Peter Dinklage, Rory Kennedy and a host of additional musicians and speakers. There were countless world premieres and parties all heightening this riveting experience. Sundance was the place to be for the independent film community. The Catholic drama NOVITIATE, by Sony Picture Classics, won U.S. Dramatic Special Jury Award for Breakthrough Director with Margaret Betts. Hudson Valley's own Melissa Leo gave one of the strongest performances of her career as Reverend Mother. Another film with a lot anticipation was MUDBOUND, directed by Hudson Valley part time resident Dee Rees and edited in Kingston, NY by Woodstock Film Festival's editing juror Mako Kamitsuna. The biggest sale this year occurred when Netflix paid $12.5 million for MUDBOUND. Among those being recognized for their extraordinary achievements during the Awards ceremony at Sundance, was the amazing and timely documentary CHASING CORAL (acquired by Netflix). CHASING CORAL won the Audience Award: U.S. Documentary, Presented by Acura. The director, Jeff Orlowski, last attended the Woodstock Film Festival in 2012 with his previous film, CHASING ICE. Finally, the tender nuanced BEACH RATS (acquired by Neon), directed by Eliza Hittman, was also recognized at the festival. BEACH RATS was presented with the Directing Award: U.S. Dramatic. Eliza Hittman was last at the Woodstock Film Festival with her previous film, IT FELT LIKE LOVE in 2013.